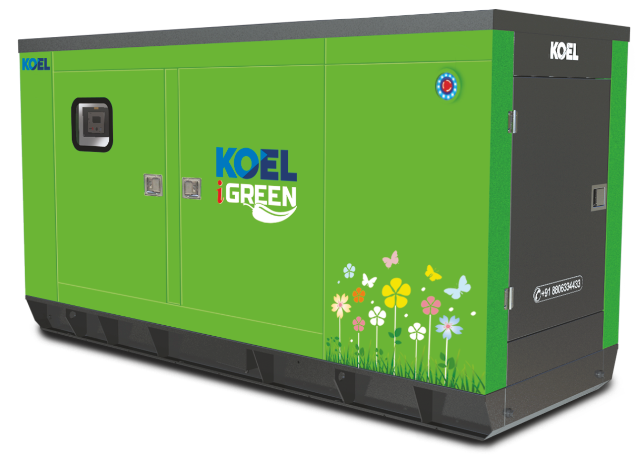 KOEL, Kirloskar Oil Engine Ltd, a market leader in power generating set manufacturers launched their latest product range of technologically advanced intelligent DG (diesel generators) today in Delhi. The range is called the i-Green series. “Customer centricity is the heart of every innovation at KOEL. These products come with in-built feature like remote monitoring of DG set. The DG actually does a self- diagnosis and reports if any problem electronically to the control room. The DG safeguards itself against any possible fatal eventualities,” he stated. The remote control monitoring feature shall allow monitoring of the set transcending the barrier of place and multiple people can access the parameters on the control panel through their mobile phones. The set comes within built AMF panel which means that the set will switch on once the grid power is off and switch off once the grid power is on. This is the standard offering in all models right from 5kVA onwards and is the distinguishing feature of the new range. The iGreen range promises a new look to the gensets in sync with company’s commitment to greener environment. The specifications include features like QR code based service manual, LED based power Status indicator, boltless canopy design etc. The appearance of the canopy has been beautified such that the gensets can now move to the forefront against the tradition of them being kept in the backyards stated Mr. Abhishek Dubey, Manager Sales (North). He mentioned that the new range includes various sets from 5KVA to 160kVA.